DALLAS, TX / ACCESSWIRE / November 11, 2016 / North American Cannabis Holdings, Inc. (USMJ) today announced that the Company has been identified by the OTC Short Report as a "Most Shorted OTC Stock." 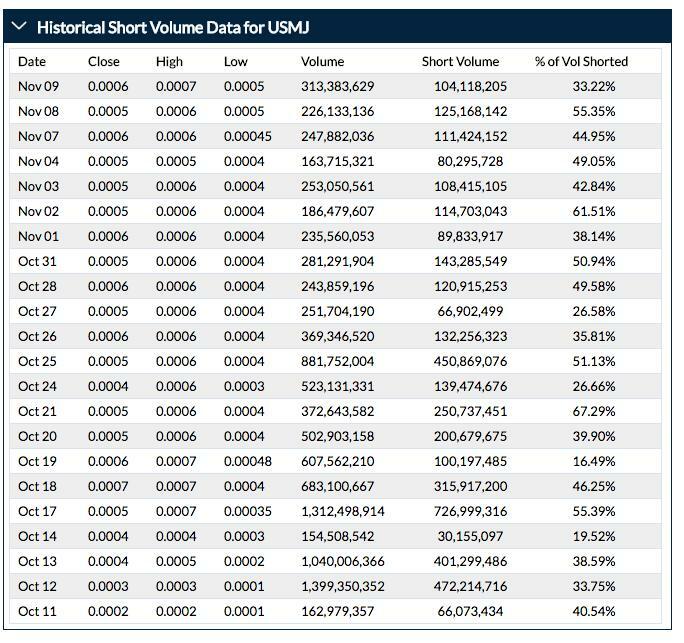 The detailed report estimates over 4 billion shares have been sold short within the last 30 days at an average weighted price per share of $0.00047. Accordingly, short sellers would have to purchase shares below this price to cover short sales and profit. On the other hand, if short sellers are not able to profit, they could be forced to buy-in making a short sale strategy backfire and instead contributing to an increase in price per share while buying an estimated 4 billion shares to cover short positions. North American Cannabis Holdings has recently reported a 23% increase in year to year sales with over $500,000 in revenue. The Company has announced a number of strategic contracts and a recent dividend declaration date. A dividend payment date announcement is pending finalization of regulatory requirements. A second transaction is in the works intended to lead to a second dividend issuance.